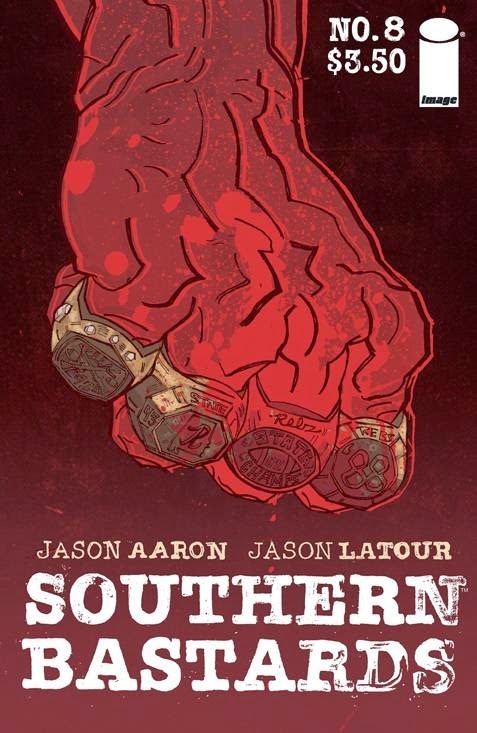 As much acclaim surrounded the first arc, the second arc in Aaron and Latour's gritty crime comic has been so much better. They took the villain of the series, the cruel Coach Boss, and took a sympathetic look at his horrific childhood. His love for football and determination to be the best no matter what his circumstances and what everyone else told him are what started him down the road to becoming the Coach that we all love to hate. This is the final issue in that bloody story, and I can't wait to see how the Jasons crush Boss too far until he becomes the man we know him to be. Remender and Acuña's epic story hardly missed a beat when starting a new volume a few months back, and this newest arc has been a pretty exciting one. 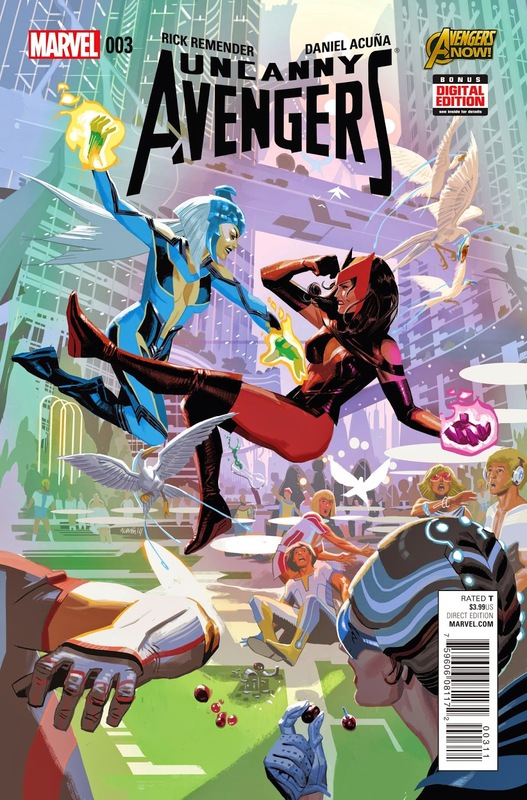 We're learning more about Scarlet Witch and Quicksilver's past while on Counter-Earth, which has got to be one of the coolest old-school Marvel concepts ever. It's big and bombastic, and Acuña's art continues to really blow me away with its stylish use of color and intense action. Always worth a read! We have finally arrived at the weird, two month break we will be receiving from your regularly scheduled comics from DC as their corporate office moves from NYC to Burbank. The lack of time to publish their regular line is being masked in the new event: Convergence. Old storylines are being brought back and meshed together before Marvel has a chance to do the exact same thing in May with Secret Wars. 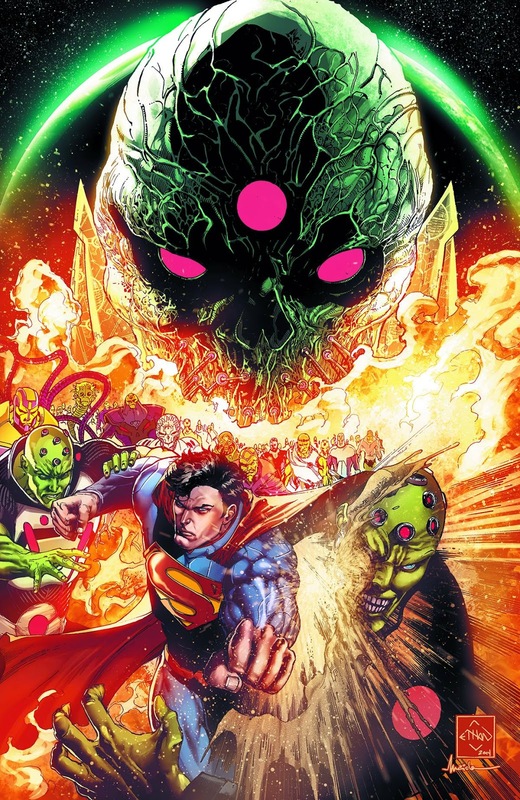 Brainiac has been collecting these alternate timelines and now we get to see a plethora of our favorite characters return for a brief period including the Wild West Justice League and Captain Carrot and the Zoo Crew. It all starts here, so if you have found yourself on the fence about this event and its multitude of tie-ins, then this is the comic for you this week. Think of it as a less well-thought out Multiversity. Yes, we recommended Batman & Robin to you last week, and we are doing it to you again this week, because this is the last issue of this comic for the foreseeable future, and it's time to see what you've missed out on these past 4 years. 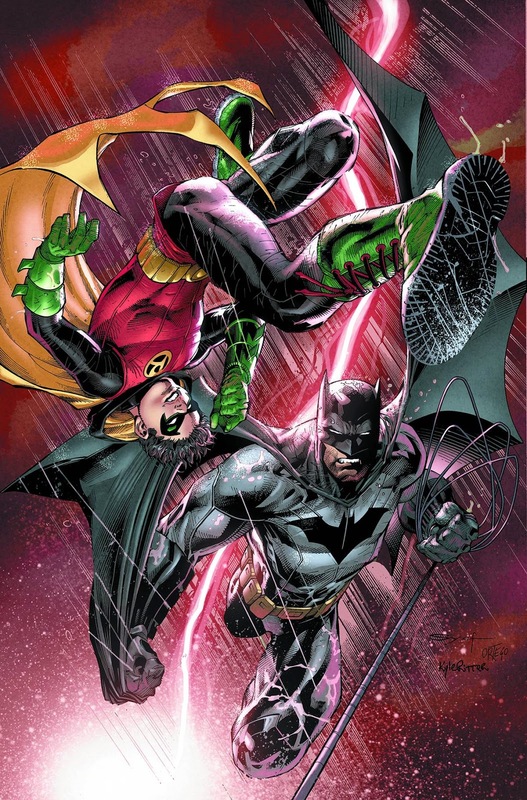 After dying and then being resurrected with super powers to only then lose those super powers, this annual sees Batman and Robin return to their normal routine of crime fighting. Those who read last week's #40 will know that there are more than a few secrets Bruce is still keeping from Damian, and it doesn't seem like too far of a stretch that those worms are about to be let out of the can. Check out what will surely be a solid ending to one of the more under-appreciated New 52 titles before it spins off into two new series: We Are Robin and Damian Son of Batman. 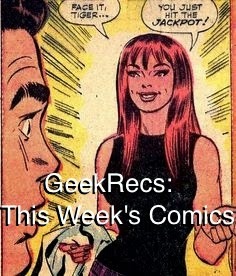 When we REALLY like a comic or a run on a series here at Geek Rex, we tend to harp on it. Long time readers/listeners already know this, but if you're just now finding us, allow us to once again explain that you should read Brian Azzarello, Cliff Chiang, and Goran Sudzuka's run on Wonder Woman. Perhaps THE must under-rated, under-read, under-appreciated run of the entire New 52, Wonder Woman completely redefined the origin and characterization of one of DC's biggest characters, bringing along new interpretations of classic gods and goddesses of Greek mythology. 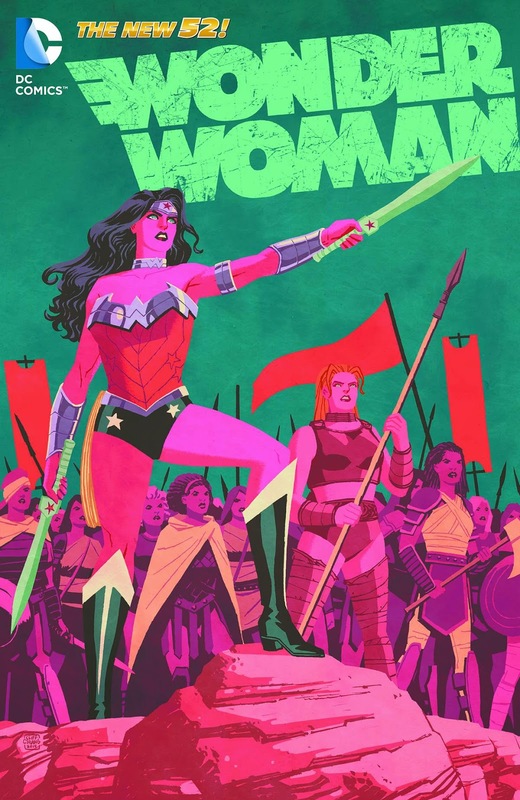 A comic that was arguably ahead of its time in an era that is looking for solid, female-centered comics, this story is one that longtime fans and those who've never read a Wonder Woman book in their life can appreciate. If for nothing else, this comic is worth the read solely for the incredibly artwork which was present each month. This trade is the finale of that incredible run. As a complete collection seems unlikely, go ahead and pick up volumes 1-5 as well if you have not already.